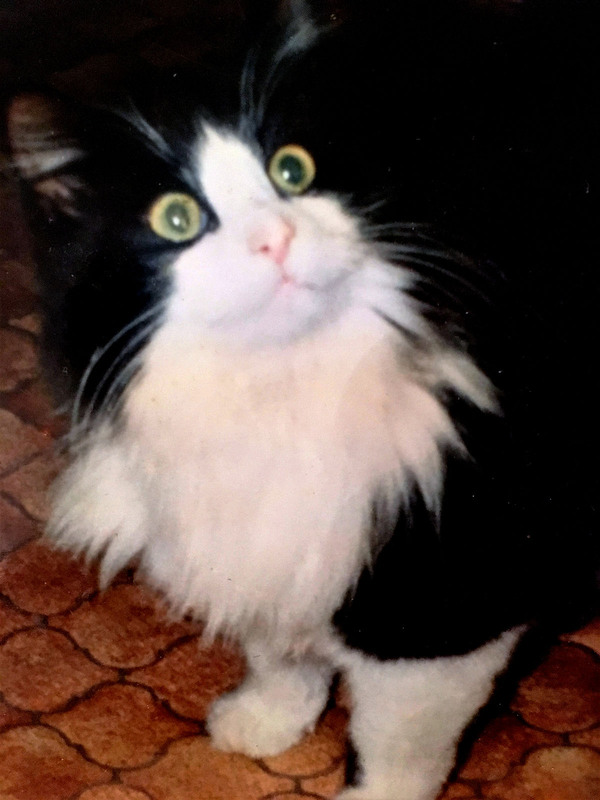 My love of cats all started when I was living at home as a child and this skinny black and white cat used to come around and forage in our dustbin for food. So, my Mum started to leave food and milk out for him in the back yard. Then the food was left on the back doorstep, but Dad said the cat was not allowed in the house. Then the food was left for him in the hall by the back door, but this was as far as he was allowed to come. OK the cat was now allowed in the house downstairs only, but not allowed on any of the furniture. By now we had named him Lucky and we had ‘adopted’ him. We were told he was approx. 1 years old. Well I’m sure you can work out that it wasn’t long before Lucky had the run of the house! And ironically Dad’s chair was his favourite! He soon became one of the family and lived to 18 years old. Lucky also had a companion who liked to sit with him when he ate his biscuits, my guinea pig Twiglet. He was my first guinea pig and was black, white and ginger. My sister had one called peanuts which had long hair and when he ran you couldn’t see his legs! I loved my guinea pig, he had such a character. He lived outside but I had taught him how to go from the front room, down a step into the kitchen and go to the loo on newspaper! He would `squeak’ every time someone went to the fridge as he thought we was getting food. My next guinea pig was called Frazzle and he was great too. Peanuts was still going strong at this point. Guinea pigs make such good pets and as long as you handle them enough they can be very affectionate and interactive.